Ready to transform your home with new flooring? Do you want your office to be more comfortable for your employees and customers? A great way to recreate your space without an extensive renovation is by purchasing new, comfortable carpet flooring. Let us show you how beautiful your home can be with the addition of carpeting throughout. 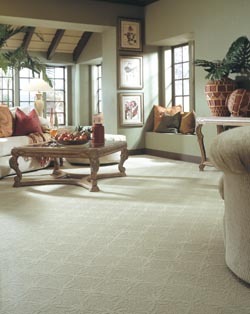 Our carpets are growing in popularity because of their beauty, durability, and quality craftsmanship. From start to finish, our flooring team offers you the kind of customer service not available at other carpet stores. Choosing carpet flooring for your home is a true investment in your space. Our sales professionals are qualified to show you around the store so you can see exactly what our selection is like. From Berber to polyester, there are samples available for you to look at, feel, and compare to one another. Thanks to updates in manufacturing processes, carpet flooring is made to last and stand the test of time. Some of the styles we sell are actually stain-repellant and will not absorb liquids, dust, and dirt. After you make your purchase, we are able to advise you concerning the proper maintenance of your new residential carpet. Maintenance of this type of flooring is easy to keep clean and fresh with a vacuum or the occasional steam cleaning. Your new carpet is sure to be truly low-maintenance. In a space that is otherwise cold, you can easily get a refresh with the addition of new area rugs. We are happy to provide you with options in a range of sizes, whether the rug is for a large living area or a bonus room. In addition, our area rugs are available in a number of styles and materials to meet your aesthetic preferences. Whether you want a solid color or a floral pattern, we have the right area rugs for your home or office space. Brand-new residential carpets are the right option for you. Contact us to learn more about current sales and special prices. We are proud to serve clients in Bradenton, Sarasota, North Sarasota, and Palmetto, FL, and the surrounding communities.